(By Susannah Marley • Staff Writer for Williamson Herald) Click HERE for full article Graci Semptimphelter has been given the Goodall Homes Student of the Month Award. A sixth grader at Battle Ground Academy, Graci serves as a mentor for 1Team1Goal, an organization founded by her mother Traci Semptimphelter which gives special needs children the opportunity to play football, participate in cheerleading, and dance. “I really like being able to see smiles on kids’ faces and for them to be a part of a team and to have a spotlight,” Graci said. Graci was also recognized as one of two Tennessee students to receive the Prudential Spirit of the Community award, a nationwide program honoring students in grades 5-12 for their volunteer work. At 11 years old, Graci is one of the youngest recipients of this award out of the 102 volunteers recognized nationwide. “Good grades and athletics are very important in our family, but the greatest achievement for us is raising kind children that will make a positive difference in the lives of others,” Graci’s mother, Traci said. “This award, and what it represents, means more to us than any trophy we have. We live in a great city, and we have chosen an amazing school for our children. 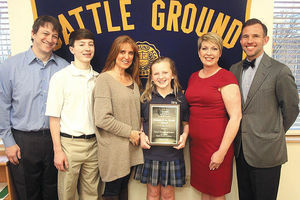 It takes a village, and we appreciate that the village helps us instill good character, morals, and values.” “Graci Semptimphelter is a born leader and wonderful asset to our school community,” BGA Director of Communications Shannon Bevins said. “She is kindness personified and is a very well-rounded student. She can be found doing everything from acing volleyball serves to working the set of a school play. And of course, she spends much time with 1Team1Goal and her buddy, Lily. We are proud to call her a Wildcat.” “I’m very happy and honored to have been nominated,” Graci said, “I want to be able to spread awareness through the community .” For more information on 1Team1Goal, visit www.1Team1Goal.org. For more information on Goodall Homes, visit www.GoodallHomes.com.